The Italian music festival “San Remo Festival” had its 65th anniversary in 2015. It is one of the most important TV shows in the Italian television. The viewing figures (12 mio.) have been increasing thanks to the presenter Carlo Conti and his assistants Arisa and Emma Marrone, who represented Italy last year in Copenhagen with "La Mia Città". There are various categories like newcomers or established where there are different prices to win. The winner of this contest was the trio Il Volo, who has received 39% of the votings (expert jury 30%, demoscopic jury 30% and televoting 40%) with opera-pop song “Grande Amore”, the outstanding performance of these three young singers has convinced in all aspects. The show was full of popular singers like Nek, who came second, Nina Zilli, Lara Fabian, Raf and some more. 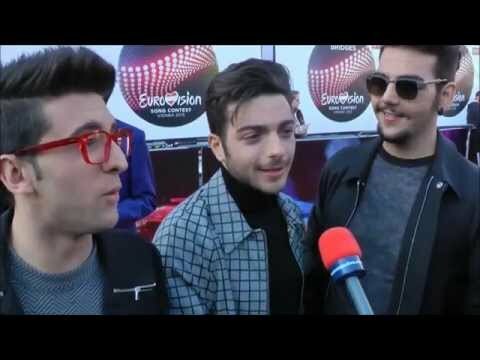 The three singers are Piero Barone, born in Agrigento, Sicily 1993; Ignazio Boschetto, born in Bologna 1994 and Gianluca Ginoble, born in Atri, Abruzzo 1995. The trio had its breakthrough the Italian TV show “Ti Lacscio Una Canzone” and The Three Tenors Plácido Doming, José Carreras and Luciana Pavarotti served as model for Il Volo. Their first album has been recorded in the famous Abbey Road Studios in London. The popularity of this trio has been leveraged by a storm. Even if there are many tenor groups, Il Volo made it to America with their opera-pop music in the Billboard charts for. They have toured and performed all over the world and even had a guest appearance at Barbra Streisand’s concert. They have been singing at the Nobel Price Concert in Oslo 2012 and received many awards. It’s great to see that Italy is sending the San Remo winner as a representative to Vienna this year. 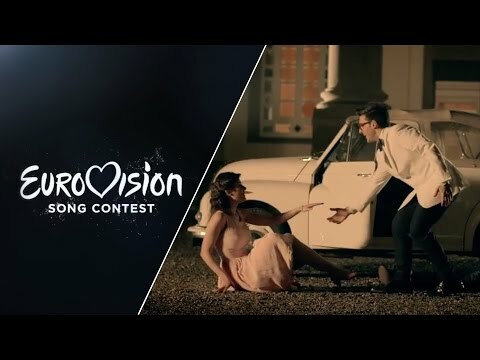 They have no need to participate in the ESC, but on the other hand it’s a privilege to represent Italy at the Eurovision Song Contest with an opera-pop song. “Grande Amore” is a dramatic song, sung with full passion and emotion by these talented young guys. The bombastically produced song will definitely impress the over 100 million TV spectators all over Europe and beyond. Having these popular singers in the Grand Final of the ESC is a real additional benefit for the whole event. It all depends on the competitors, but this will definitely score very well. Buena scelta, Italia! For Italy it’s the 42nd time participating in the Eurovision Song Contest! The original idea of the ESC resulted from the Italian music festival called “San Remo Festival” which started in 1951 for the first time and it’s still exciting and very popular. The concept came up to do a similar contest on an international level, which has become reality in 1956. Normally one of the winners of the San Remo festival has been chosen to be the Italian representative for the ESC. In the ESC Italy has won twice “Non Ho L'étà” by Gigliola Cinquetti in 1964 and “Insieme: 1992” by Toto Cutugno in 1990. Over the years many of the Italian contributions became hits and even evergreens all over Europe and are strongly connected with typical Italian music like “Per Lucia” by Riccardo Fogli in 1983 (11th), “Gente di Mare” by Umberto Tozzi & Raff in 1987 (3rd) and “Fiumi di Parole” by Jalisse in 1997 (4th). Furthermore there were many Top 10 rankings for Italy – 4 times 2ndand 4 times 3rd -, so it’s one of the most successful countries in Eurovision. The chances for a Top10 placing are 71%. Italy has paused for twelve years (1998 – 2010) until the Italian broadcaster RAI has decided to return in 2011, this has been highly appreciated internationally, as Italy is known for high quality songs. Luckily, Italy shaped up very well in Düsseldorf with “Follia D’Amore” by Raphael Gualazzi and came 2nd. One year later with “L’Amore E Femina” by Nina Zilli a 9th rank could be reached. Last year Marco Mengoni with "L'Essenziale" could even make a respectable 7th place in Malmö, while last year's entry "La Mia Città" by Emma Marrone only reached the 21st place in Copenhagen. Nevertheless Emma Marrone co-hosted the San Remo Festival 2015.